Een mooi artikel ter ere van Israels 64ste verjaardag. Dit is nog eens wat anders dan de rommel die Volkskrant journalist Rolf Bos voortbracht. May 14, 1948, was a Friday, and unbearably hot. A desert wind blew from the east, fanning the countryside like a blow-dryer. For three consecutive sun-grilled days we had been hacking trenches out of a Jerusalem mountainside on the city's western edge - where Yad Vashem now stands - overlooking the Arab village of Ein Kerem. There were about 25 of us, armed with pickaxes, shovels, and a dozen World War I rifles - an inglorious bucket brigade of diggers, fortifying a narrow sector of Jerusalem's western front. In truth, there was no real frontline where we were, and, other than sporadic sniper fire and an occasional mortar shell, it was quiet. But rumor had it that Iraqi irregulars were infiltrating into Ein Kerem to join up with a Jordanian brigade coming up from Jericho, to launch an offensive that night against besieged western Jerusalem. We were supposed to stop them, but nobody knew how, least of all the man in charge, a fellow called Elisha Linder. With 12 obsolete rifles and a motley, untrained crew like ours, what was he supposed to do? One insuperable problem was his lack of communication with the outside world - no field phone, no intelligence, not even a radio. So, in the absence of solid facts amorphous rumors mushroomed: Ben-Gurion had capitulated to Washington not to declare independence; the British were not quitting Palestine; Arab armies were invading; Arab governments were suing for peace. In truth, thirst, not Arabs, was our foe that day. I was delegated as a water-carrier with another fellow, lugging drink from a distant well for the diggers. The other fellow was a Holocaust survivor named Leopold Mahler, grand-nephew of the composer, and himself a violinist. Mahler was a craggy, disillusioned sort whose most cherished possession was his violin, which he carried strapped into a knapsack on his back. With the mountainside cisterns contaminated, the nearest water was in an abandoned orchard a mile away. To get to it we had to run a snipers' gauntlet, up a steep zigzag path to the crest of the mountain, and then sprint down to the orchard on the other side. There, in the shade of the trees, was the well, its water murky but cool. We hauled it back in jerry cans, two to a man. And the only way to drink it was through a handkerchief so as not to swallow the bugs. Clambering up the zigzag path on that late Friday afternoon, a sniper's bullet whistled past Mahler's face and sliced clean through a tree branch as thick as salami, just above his head. With a brittle crack, the severed bough struck his violin case so sharply it forced him to his knees. He looked up at me dazed. "My violin," he gulped. "It's shattered. I'm finished." I GRABBED him by the shoulders and exhorted him to pull himself together. But he pushed me off, raised himself onto a rock, unstrapped the knapsack, and very gently pulled out his wooden violin case. It was cracked. Cautiously, he opened the lid and lifted out the instrument, turning it this way and that, sliding his eyes very slowly over every inch of it. To me, it looked as exquisite and delicate as a butterfly. Mahler pursed his lips to blow off the grime, took the violin under his chin and, with closed eyes, meticulously tuned each string. Delicately he replaced the instrument, and returned the cracked case to the knapsack and strapped it onto his back. While so doing he said, "My violin is perfect. If I don't survive, give it to the Philharmonic." "That's daft talk," I said, and we picked up our load and, stumbling over rocks and tripping through thickets of dry thistles, we sprinted back to the diggers on the mountainside. There, Linder filled us in on the latest batch of rumors to come his way: the Arabs were plundering downtown Jerusalem; a coordinated Arab offensive was under way; the British were siding with the Arabs. "We're totally blind up here," he groused, and he instructed Mahler to hitch a ride into town by whatever means, and find out what was actually going on. "Come back with hard news," he commanded. As the sun went down grimy, exhausted diggers assembled in the glow of a hurricane lamp hanging on the door of a stone ruin, hidden from enemy view, to recite the Sabbath eve prayers - Kabbalat Shabbat. It was a heavenly pause; Shabbat stillness seemed to reign over everything. But then a shell shrieked and blasted the lower reaches of the mountainside, and a headlight briefly cut through the cypress trees at the approaches to Ein Kerem, and we all rolled, crawled, and scrambled for cover. Utter silence followed, broken only by the crunch of rushing feet, panting breath, and the winded cry of Leopold Mahler running out of the blackness into the light of the hurricane lamp by the stone ruin, shouting, "I have news. I have news." To a man we scampered back into the flickering glow where Linder grabbed him by the arms and snapped, "Well - talk. What did you find out? Are the Arabs plundering downtown Jerusalem?" Mahler wheezed not. On the contrary, the Jews had taken over the whole area. And to vividly substantiate his claim he opened his shabby coat wide and began pulling from its bulging pockets forgotten luxuries like triangles of Kraft cheese, Mars bars, and Cadbury chocolate. Then, he unstrapped his knapsack, and from its side pockets spilled out cans of peaches, jars of Ovaltine, and a bottle of Carmel wine. We watched, eyes popping, as Mahler told how he had come by his booty: It was from the abandoned officers' mess of the British police headquarters near Zion Square. The English had evacuated the whole area that morning. Moreover, all Union Jacks throughout the country had been hauled down preparatory to midnight when British rule of Palestine would end. "Has Ben-Gurion declared independence, yes or no?" asked Linder, beside himself with impatience. "David Ben-Gurion declared independence this afternoon in Tel Aviv. The Jewish state comes into being at midnight." There was a dead silence. Midnight was minutes away. Even the air seemed to be holding its breath. "Oh, my God, what have we done?" cried one of the women diggers, fitfully rubbing her chin with the tips of her fingers. "What have we done? Oh, my God, what have we done?" and she burst into tears, whether in ecstasy or dismay I will never know. Then cheers, tears, embraces. Every breast filled with exultation as we pumped hands, cuddled, kissed, in an ovation that went on and on. Nobody wanted it to stop. "Hey, Mahler!" shouted Linder cutting through the hullabaloo, "Our state - what's its name?" The violinist stared back blankly. "I don't know. I didn't think to ask." "You don't know?" Mahler shook his head. "How about Yehuda?" suggested someone. "King David's kingdom was Yehuda - Judea." "Zion," cried another. "It's an obvious choice." "Israel!" called a third. "What's wrong with Israel?" "Let's drink to that," said Elisha with delight, grabbing hold of a tin mug and filling it to the brim. "A lehaim to the new state, whatever its name." "Wait!" shouted a hassid whom everybody knew as Nussen der hazzan - a cantor by calling, and a most diligent volunteer digger from the ultra-Orthodox Mea Shearim Jerusalem quarter. "It's Shabbos. Kiddush first." Our crowd gathered around him in a hush as Nussen der hazzan clasped the mug and, in a sweet cantorial tone began to chant "Yom hashishi" - the blessing for the sanctification of the Sabbath day. As Nussen's sacred verses floated off to a higher place of Sabbath bliss, some of us sobbed uncontrollably. Like a violin, his voice swelled, ululated, and trilled in the night, octave upon octave, his eyes closed, his cup stretched out and up. And as he concluded the final consecration - "Blessed art thou O Lord, who has hallowed the Sabbath" - he rose on tiptoe, his arm stiffened, and rocking back and forth like an ecstatic rabbi, voice trembling with excitement, he added the triumphantly exulted festival blessing to commemorate having reached this day - sheheheyanu, vekiyemanu vehegiyanu lezman hazeh." The second reason was explained to me by two Swedish activists who loved the mixture of Arak and fresh grapefruit juice in their cocktails. I asked them once this one clichéd question that always comes to mind  "So why Israel of all places? Why not Syria? Egypt? Russia or China?" One of them put on a serious face. "Are you insane?" he asked me. "These are all extremely dangerous places!" Ze weten dat ze in Israel weinig risico lopen en het zelden gebeurt dat een buitenlandse pro-Palestina activist ernstig gewond raakt of wordt opgesloten en gemarteld. Tegelijkertijd ben je hier in heus oorlogsgebied, en deel van een conflict dat dagelijks in de media komt. Je zit niet in je luie stoel maar doet iets, en bent daarmee een held voor je omgeving. I hope that once they are here, beyond the screens of blind hatred, they will be able to find the light in the existence of Israel. I hope they will embrace how lucky they are to be "spoiled radicals" here with us. Then they might take a step back and scale back the "Palestine will be free from the River to the Sea" calls a bit. Hopefully they will realize that if that actually happened, and Israel disappeared, they will not have anywhere else to go. Niet alleen de pro-Palestina activisten, ook talloze VN medewerkers en andere hulpverleners zouden een probleem hebben wanneer Israel er niet meer zou zijn. De Arabische wereld zou bovendien op zoek moeten naar een nieuwe zondebok om al hun problemen aan te wijten. Vandaar dat veel van die organisaties en hulpverleners helemaal niet uit lijken op het oplossen van het conflict; het is een gigantische business die er vooral op gericht is zichzelf in stand te houden. During my first year at the Hebrew University I worked at a typical Jerusalem bar  coffee and pastry in the morning, hamburgers for lunch and plenty of beer in the evening. The bar's proximity to Jerusalem's city center made it popular with the foreign peace activists who arrive in Jerusalem quite often. On numerous occasions I spoke to those who grabbed a drink after another day of protesting in Sheikh Jarrah or Bi'lin. Time after time I found myself wondering  why do they even bother coming here? How can a 20 year old Danish boy wake up one morning and tell his parents he's flying to the Middle East? A foreign reporter from Spain, who loves Israeli red wine, told me once how every foreign correspondent dreams of being stationed in Israel. "This is a foreign correspondent's paradise!" she said. "Where else can you go to restaurant in a city such as Tel Aviv, grab a drink, or go dancing on Dizengoff Street, and sleep at a fancy hotel, when the only thing that separates you from your authentic 'battle field' report is a 45 minute drive into Jerusalem or Bil'in and Naalin? Indeed, Israel holds a strange dissonance that we have developed throughout our years of living by the sword. The south is bombed, one million citizens sit in bomb shelters, but 15-20 kilometers away  everything is just the same. We have created a situation where little Israel consists of two parallel universes. The foreign activists fit perfectly into one and only one of those universes  the good, comfortable and quiet one. These people know that nothing bad is going to happen to them here. The massive exposure of the high-ranked Israeli officer who struck a protestor, and the amount of condemnation it received, proves how unusual this incident was. When the worst thing that could happen to you is to get smacked on the face and become a war hero among your friends  why wouldn't you hold up a sign? Why wouldn't you throw a stone at a soldier or a police officer? "So wait," I asked in all seriousness. "You wouldn't have come here if you thought you could get badly hurt?" My Swedish friend grinned. "I don't think so," he said. "I may be a radical, but I'm also a spoiled one!" And they both burst out laughing. That's when I realized that for many of those foreign peace activists, this is all just a game. And in this game we, the Israelis and Palestinians, are the pieces. They come from all corners of the world to a faraway country they have never been to before. They confront soldiers and policemen, blocking roads and holding signs. Moreover  as long as they have their cold beer by the end of the evening, as long as they lay their heads in a comfy and friendly hostel  they will continue to arrive. They take advantage of what we're most proud of: Our freedom, democracy and the tolerance that we're so afraid to lose. They take advantage of the strange system we have developed, the one that lets us disconnect ourselves from reality and continue with our lives even when real fighting takes place so close to us. “Exposure to films like this and others cause harm to the Arab and Islamic world and promotes other elements." 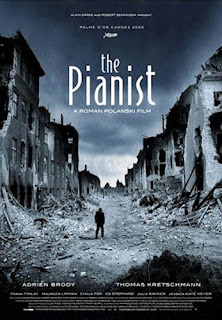 Jordanian director criticizes Saudi network for showing "The Pianist"
Saudi Arabia's MBC2 decided to show the Oscar winning Holocaust drama, "The Pianist," over the weekend. And Jordan's Ammon News is very upset about it. TV director and critic Amer Gharaibeh criticized the channel, saying that it is promoting a Jewish agenda and inaccurately describing the Holocaust. He is particularly upset that the film empathizes with the Jews being slaughtered, and makes the viewers do so as well - obviously a terrible crime to this critic. Scenes where German soldiers wantonly shoot Jews are described by this reviewer as utterly unrealistic and unnecessary. Gharaibeh complains that the film "emotionally appeals to the world about Jews." And for what purpose? As he writes, "Exposure to films like this and others cause harm to the Arab and Islamic world and promotes other elements." Israel trekt burgerschap van 1,6 miljoen Palestijnen in? Jordanië wil het staatsburgerschap van 1,6 miljoen Palestijnen afnemen, die nu in Jordanië leven en afkomstig zijn van de Westelijke Jordaanoever of Oost-Jeruzalem. So, in other words, over a million Palestinian citizens of Jordan will, if this law goes into effect, become stateless in order to decrease the country's Palestinian population (now nearly half of the population of Jordan) and create the expectation that they will either return to Israel proper (per the call by Palestinian activists and their supporters of an "unlimited right of return") or become citizens of the future state of Palestine. Regarding the latter idea, as PA leaders have already said that such Palestinians living in the "diaspora" will not become citizens of a newly created Palestinians state, the move by Jordan would create more permanently stateless Palestinians who will be cynically used to continue the assault on Israel's legitimacy, even following a future peace agreement. Dit soort zaken staat de vrede evenzeer in de weg als de nederzettingen, maar om een of andere reden kom je ze nooit tegen in NRC Handelsblad of een andere kwaliteitskrant of medium. Het probleem bestaat simpelweg niet in de ogen van deze journalisten. Israel moet weg uit de Westbank zodat de Palestijnen daar een staat kunnen stichten en dan kunnen we overgaan tot de orde van de dag, zo denken velen. Juist door deze houding helpen ook Westerse landen en media het conflict voort te zetten in plaats van bij te dragen aan een oplossing. Alleen wanneer naast Israel, ook de Palestijnen en Arabische staten op hun verantwoordelijkheid en aandeel in de problemen worden gewezen, kan een oplossing in zicht komen. Maar daar ziet het voorlopig niet naar uit. Strangely missing from the Jordan page of the Guardian is a remarkable story. Jordan has decided to revoke the Jordanian citizenship of Palestinian Authority and PLO officials, sources in Amman disclosed Wednesday. quoted government officials in Amman as saying that the decision to revoke the Jordanian citizenship would also affect some 1.6 million Jordanians of Palestinian origin. The move coincides with a new electoral law in Jordan that seeks to limit Palestinian representation in parliament. While its unclear, from the article linked to above, who these 1.6 million Jordanians of Palestinian origin refers to, it's likely those Palestinians who used to live in Jerusalem and the West Bank (when it was under Jordanian control from 1949 to 1967) who are now (following the Six Day War) residing in Jordan proper, and considered "refugees". Amman has defended the decision to strip Palestinians of their Jordanian citizenship by explaining that it is aimed at "preserving the Palestinians' national identity and paving the way for their return to Palestine." A gross violation of human rights? Supremely. A story worthy of coverage, and liberal sympathy, by Guardian reporters? Of course not! Do I even have to ask how the Guardian would cover the story if it was Israel revoking the citizenship of over one million Palestinian Arab citizens? Boekrecensie: Israël van lieveling tot paria? Het boek “Israël van lieveling tot paria?” door Hans Knoop verscheen in september 2011. We plaatsten hier al eerder een recensie uit Joods Actueel. Infoteur Etsel (zelf een religieus zionist) besprak onlangs een hoofdstuk uit dit boek over de rol van de journalistiek bij Israels huidige slechte imago, een thema dat ons ook regelmatig bezighoudt. In 2011 kwam de bekende Joodse journalist Hans Knoop met het boek 'Israël van lieveling tot paria?' Een interessant boek waarbij Hans Knoop tracht na te gaan wat de oorzaken zijn van Israëls internationale isolement. Hij legt de schuld hiervan zowel bij de wereld als Israël zelf. Knoop ziet de Joodse aanwezigheid in Judea en Samaria, hoewel die niet illegaal is, als grootste struikelblok. Allereerst meldt Hans Knoop dat Israël nu een andere staat is dan vóór 1967. Israël was toen een agrarische staat en thans behoort het land tot de vijf sterkste militaire staten ter wereld en is het modern en technologisch ontwikkeld. Destijds was elk onderwerp over Israël nieuws. Tegenwoordig geldt dat niet meer. Dat had mede met de Tweede Wereldoorlog te maken. De wereld was overrompeld dat Joden zo goed konden presteren. De Zesdaagse Oorlog van 1967 deed daar nog een schepje bij bovenop. Daarna werkte het sprookje niet meer. Joden werden weer als normale mensen beschouwd en ook zo beoordeeld. Knoop noemt die overdreven bewondering voor Israël van vóór 1967 een vriendelijke vorm van antisemitisme (ik onderschrijf dat geheel). Kennelijk zag de wereld de Joden als onvolwaardig en moesten Joden over hun bol geaaid worden. Israël raakte volgens Knoop aan die aandacht verslaafd. Deels kan ik me vinden in de uitleg van Knoop. Toch spelen er volgens mij nog wel wat meer zaken. Ten eerste zijn veel mensen op den duur het conflict zat geworden. Vóór 1967 werd er weliswaar veel over Israël bericht maar dat was voornamelijk via de kranten en de radio. Na 1967 ging de televisie een veel belangrijkere rol spelen. Dus niet alleen Israël veranderde, maar ook de media. De oorlogen kwamen zo veel dichter bij de mensen. Dit gold vooral voor de twee Intifada's die plaatsvonden. Deze werden uitgebreid op televisie getoond. Die beelden oogden niet altijd even prettig en hebben het imago van Israël niet veel goeds gedaan. Wanneer bovendien kijkers dagelijks die beelden zagen werden ze het op den duur zat. Ze hadden in principe nog wel begrip voor Israël, maar gingen toch onbewust sympathie koesteren voor de underdog (de Palestijnen) in de hoop dat als Israël onder druk gezet zou worden er dan sneller een eind zou komen aan het conflict. En hoe langer het conflict duurt des te meer mensen zich tegen Israël gaan keren. Hans Knoop verzuimt dus mijns inziens de opkomst van de televisie te melden. Een tweede punt voor de omslag is het feit dat in Nederland en Europa steeds meer moslims zijn komen wonen vanaf de jaren'60. Deze hebben er voor gezorgd dat de bevolkingssamenstelling veranderde en er veel meer mensen kwamen die zich tegen Israël gingen verzetten (autochtone Nederlanders worden hierbij beïnvloed door allochtone Nederlanders). Voor Israël is de invloed van de islam in Europa een groot gevaar. In de VS speelt dat probleem veel minder. Vandaar dat de banden tussen de VS en Israël veel beter zijn dan de banden tussen Europa en Israël. In describing AIPAC’s Arab cousin, Bard draws some useful comparisons between the two lobbies, which are not as similar as one might imagine from his book’s title. AIPAC is a grassroots organization funded by U.S. citizens that represents the broad sentiment of Christians and Jews who are interested in one issue—protecting and promoting the U.S.-Israel relationship. The Arab lobby, by comparison, has little organic U.S. backing and divides its efforts between two causes—oil and Palestine. The former is managed in Washington by what Bard calls the “petrodiplomatic complex” of former U.S. diplomats and intelligence officers, politicians, and defense executives. Funded by oil companies, the weapons industry, and Arab energy producers, mainly Saudi Arabia, it enjoys virtually unlimited financial resources. For instance, AIPAC’s annual operating budget is $60 million a year—pocket change to a Saudi prince, like Alwaleed Bin Talal, who in 2005 gave $20 million apiece to Georgetown and Harvard. Toch is het de Israllobby die wordt voorgesteld als bedreiging voor de VS en haar belangen, en wordt haar macht en invloed vaak breed uitgemeten. In Nederland is er om de zoveel tijd wel weer een reportage over de macht van deze lobby, die zou verhinderen dat mensen ook maar enige kritiek op Israel hebben (vreemd dat er wel zoveel en zulke doorgeschoten kritiek op Israel wordt geuit en ook in de media gepubliceerd) en met louche taktieken de politiek en media bewerkt. Ik heb nog nooit een reportage op TV gezien over de Arabische lobby. Daarom hier een bespreking van Mitchell Bards boek over de Arabische lobby. One of the characteristic laments of the Arab intelligentsia in both Washington and the Middle East concerns the inability of Arab nations to make their cases to the U.S. public. If only the Arabs weren’t so divided, the refrain goes; if only they better explained themselves and the plight of the Palestinians; if only the Arabs were as clever as the Jews; if only there was an Arab lobby as powerful as the Israel lobby. But there is an Arab lobby in the United States—one as old as, if not older than, the Israel lobby, and it has helped to shape U.S. foreign policy and economic life since the end of World War II. Mitchell Bard’s The Arab Lobby: The Invisible Alliance That Undermines America’s Interests in the Middle East describes how this Arab lobby—from U.S. foreign service officers, oil companies, Christian anti-Zionists, and Ivy League universities to Gulf Arab states, Arab-American activists and Islamist ideologues—exercises its influence in U.S. politics. The book is already being dismissed by critics as a slapdash attempt by a former AIPAC employee to answer Stephen Walt and John Mearsheimer’s 2007 book, The Israel Lobby. But those who actually read the new book will find a serious and timely look at a powerful and remarkably under-studied influence on U.S. foreign policy. The Palestinian issue is paramount to the Arab-American sector of the Arab lobby. However, just as the Palestinians are divided against themselves—between Hamas and Fatah, among contending Fatah factions, as well as among competing clans—it is not the Palestinian cause that unites the Arabs or Arab-Americans but anti-Israel sentiment. The same goes for many of the Arab lobby’s domestic anti-Zionist partners, some of whom are motivated by religious conviction, especially the Presbyterians, and others by political ideology, but all of whom can agree on disliking first the idea and then the reality of a Jewish state. The real power is in the hands of the Arab lobby’s oil sector, the role of which is to keep the Arab oil producers happy by ensuring that Americans stay addicted to oil, that the defense industry keeps its production lines open, and that the image of Arab states stays polished, even for state sponsors of terror, like Saudi Arabia, and states whose rule is founded on flagrant social inequalities, the torture of dissidents and unbelievers, and other practices that most Americans rightly find abhorrent. With all the demands for U.S. presidents to pressure Israel, it’s worth noting that U.S. officials have rarely done anything but accommodate the Saudis. The one striking exception, as Bard notes, was John F. Kennedy’s demand that Saudi Arabia abolish slavery. Typically, U.S.-Saudi relations have been conducted in the dark, a trend that started in July 1945, when President Harry Truman approved construction of the Dhahran air base using existing War Department funds to evade congressional oversight. This became a precedent for keeping most of the U.S.-Saudi relationship secret, or at least beyond public scrutiny. For years, the U.S. government acceded to the wishes of the Saudis and other Gulf states to conceal information about Arab investments in the United States, and even U.S. arms sales to Saudi Arabia were classified between 1950 and 1972. Nor are the Saudis shy about promising to unleash jihad against those who cross their path, as when they threatened the British government when it was investigating the unsavory details of a Saudi arms purchase from a British weapons maker. The story of the Arab lobby is also a story about Washington, more specifically an influential segment of the U.S. political elite that has contempt for the rubes who don’t understand that it is in the U.S. national interest to lean on the Zionists in order to make the Middle East’s Muslim Arab majority happy. Perhaps that is true, but it’s worth remembering that at the same time the Zionists succeeded in lobbying the Truman Administration to support a Jewish state, there was still widespread anti-Semitism throughout America, even as the horrors of the Final Solution were becoming known to the general public. It is comforting to believe that the 63 percent of Americans, according to a recent Gallup poll, who side with Israel rather than the Palestinians are now and will always be stalwart friends of the Jews. But in the end all we know for certain about Americans is that they can smell what stinks. The Saudi lobby pays Washington power-brokers to talk over the heads of ordinary Americans because the latter have enough horse sense to know that a regime that withholds the rights of women as well as those of its Shia minority, outlaws the practice of Christianity and Judaism, and promotes anti-American causes is not in any meaningful sense of the term a U.S. ally. As Bard’s book documents, the Saudis’ well-paid American agents have been making the same arguments for 60 years. The reason their message is not getting through is not that Americans are stupid and susceptible to Zionist propaganda or that the Jews who “control” Congress and the media are blocking access to the truth. The majority of Americans haven’t yet joined in the chorus led by Walt, Mearsheimer, and their cohort because Americans simply do not like to be threatened by extortionists who warn that if you don’t do what we say we will turn off your lights and shut down your car engines, and if you don’t change your position on Israel, we will kill you. Lee Smith is a senior editor at the Weekly Standard, a fellow at the Foundation for Defense of Democracies, and the author of The Strong Horse: Power, Politics, and the Clash of Arab Civilizations. Israël kan geen goed doen bij Trouw. Wanneer er een tijdlang minder `hotnews' over of naar aanleiding van Israël is, dan blijft het patroon van een subtiele negatieve ondertoon bij berichtgeving over dit land. Dat blijkt maar weer eens uit het bericht `Christelijke bezoekers leveren Israël miljoenen op', wat op 7 april in Trouw werd gepubliceerd. Foto uit Trouw, © EPA. 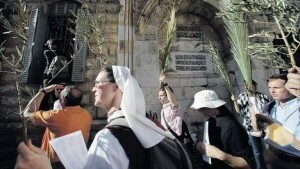 Een non en een groep toeristen lopen door de Oude Stad van Jeruzalem met Palmpasen. In de lead wordt gemeld hoe souvenirhandelaar Nicolas Sjbeita zijn klanten herkent en met ze omgaat. In de volgende alinea worden getallen genoemd die, na aanvankelijke stagnatie als gevolg van de Tweede Intifada, een indruk moeten geven van het groeiende aantal toeristen wat naar Israël komt. Het land is de laatste jaren vooral bij Christenen in de gunst geraakt. So far so good. Eindelijk eens een positiever bericht in Trouw over Israël zou je denken. Het aanvankelijk nog verborgen gehouden en uiterst subtiele katertje komt eerst in de derde alinea. Op z'n Hollands uitgedrukt krijg je de indruk dat Israël ervan wordt beticht een slaatje uit het toerisme te slaan door er flink in te investeren. Niet alleen met gelikte reclamecampagnes en het gemakkelijker uitreiken van visa aan pelgrims, ook door het op kosten van de staat uitnodigen van touroperators en Christelijke leiders die in luxe hotels worden ondergebracht, met als doel om iedereen aan te sporen naar Israël te gaan. Dat overkwam ook Tim Clark, voorganger van een Amerikaanse Pinkstergemeente. Hij heeft echter totaal geen moeite met de intentie van Israël om aan toerisme te verdienen en `spoort mensen graag aan om naar Israël te gaan'. Verderop in het artikel wordt opgemerkt dat sommige Bijbelse trekpleisters op de bezette Westelijke Jordaanoever liggen, wat het religieus toerisme dwarsboomt. Te pas en te onpas wordt die bezetting overal bijgehaald, terwijl de status van de Westelijke Jordaanoever juridisch gesproken niet vaststaat. Een saillant detail hierbij is dat in het artikel de Amerikaanse Pinksterbeweging wordt genoemd. De meeste leden daarvan geloven dat God de Joden het land Israël, waar in hun visie de Westbank deel van uitmaakt, heeft beloofd , Jeruzalem de hoofdstad is en zich daarom niet door de bezetting laten belemmeren. Er zijn mondiaal echter bijna 2 miljard Christenen. Een groot deel van hen heeft allang afstand genomen van de landbelofte uit het Eerste Testament, maar zijn en blijven betrokken bij de Bijbelse trekpleisters, al dan niet in bezet gebied. Tim Clark heeft gelijk om er helemaal geen moeite mee te hebben mensen aan te sporen om naar Israël te reizen. Het is immers heel logisch dat Israël wil verdienen aan de groeiende toeristenstroom. Elk ander land in de wereld zou dat ook doen, waarbij eveneens gelikte campagnes worden gevoerd. Nu wordt gesuggereerd dat met name Israël zo te werk gaat. Bovendien is het meer dan logisch dat Israël toeristen wil terugwinnen. Maar Israël kan het nooit goed doen bij Trouw. Enige jaren geleden heeft een redactielid van Trouw tijdens een telefonische toelichting naar aanleiding van het beleid inzake de berichtgeving over het Midden Oostenconflict gezegd dat, `na tientallen jaren lang de kant van Israël te hebben gesteund het inmiddels de hoogste tijd werd om als krant de Palestijnen het voordeel van de twijfel te gunnen'. De redactie is daarin goed geslaagd, wat ten koste is gegaan van een onafhankelijke berichtgeving. Alles wat met Israël te maken heeft wordt, als het maar enigszins kan, op een negatieve manier onder de aandacht van het lezerspubliek gebracht. Een wel heel schrijnend voorbeeld hiervan is het artikel `Het uitverkoren volk moet perfect zijn', waarin op een heel negatieve manier het uiterst subjectieve verslag van een zwangerschap in Israël wordt beschreven. Maar ook het artikel van Antoine Verbij, wat als reactie op een omstreden en recent verschenen gedicht van Günther Grass in de Duitse pers op 8 april in Trouw is gepubliceerd, past goed in het beleid van die krant. Het wekt namelijk de stellige indruk dat Grass het toch allemaal goed heeft bedoeld en de paniek die, om heel begrijpelijke redenen, in Duitsland is ontstaan alleen maar op bijna niet te bespreken emoties is gestoeld. Uit deze beide nog andere genoemde artikelen blijkt ook dat de ronduit anti Israëlhouding van Trouw de vorm van een obsessie aan begint te nemen. "Door het gepolariseerde karakter van het debat over Israël en de Palestijnse Gebieden lijkt een werkgroep niet het geëigende instrument om het debat in de partij te organiseren. Het ligt in de lijn der verwachtingen dat de werkgroep derhalve zal worden opgeheven." Jammer dat ik geen lid meer ben van GroenLinks om eens uit te testen hoe democratisch en open GroenLinks is wat dit betreft. Ik vrees echter dat de banden met het Palestina Komitee en andere anti-Israel organisaties dusdanig zijn dat men het probleem niet zal erkennen. De PvdA gaat een eigen discussiegroep over het Midden-Oosten opheffen omdat de werkgroep de schijn van partijdigheid wekt. Aanleiding voor dit besluit is het weigeren van emeritus hoogleraar Jaap Polak als lid van de werkgroep 'Recht in het Midden-Oosten'. De werkgroep beoogt "in openheid" te discussiëren over het standpunt van de PvdA over het Midden-Oosten. Toch mocht de emeritus hoogleraar geen lid worden. De PvdA schreef Polak dat "de werkgroep niet de plek voor u is in de PvdA waar u zich op de door u gewenste manier met het onderwerp bezig kunt houden." Het bestuur van de werkgroep wenste, in tegenstelling tot het doel van de werkgroep, geen open discussie over het Midden-Oosten. Zo schreef men Polak dat de werkgroep er is om "standpunten die de partij al heeft (...) met meer kracht naar voren te brengen." Op dissidente standpunten  ergo: de meer pro-Israëlische Polak  zat men niet te wachten. Polak had er in zijn mail aan de werkgroep juist voor gepleit verschillende standpunten te bediscussiëren. "Het is volsterk ongepast om een lid van de partij de toegang tot een open discussie te ontzeggen. Mensen die niet het standpunt van de werkgroep delen, worden geweerd. Dit past niet bij een democratische partij." Polak deed deze week zijn beklag bij de PvdA over de gang van zaken. Internationaal Secretaris Kirsten Meijer antwoordde hem daarop dat het partijbestuur het bestuur van de werkgroep heeft aangesproken op de weigering. Zij vertelde hem ook dat er al een eerder geval van weigering is geweest.